Harley Davidson was founded in Milwaukee; Wisconsin in 1903 this legendary manufacturer has kept the spirit of American motorcycling alive with its path-breaking products. This is known as the distinctive 'potato-potato' sound courtesy their potent large-capacity V-twin engines these bikes have made many a motorcyclist drool with the sheer auditory delight. Harley Davidson Iron 883 is an entry-level cruiser and is assembled in India. As the name for the motorcycle goes, it carries an 883cc, twin cylinder engine producing 50 BHP (approx.) and 70 Nm of torque. The Harley Davidson Iron 883 is a poster bike of the anti-chrome movement. The engine of the bike is black powder coated with black rocker covers. The air cleaner of the bike is also covered with black. Little rubber us showed from the chopped fenders of the bike. The black front forks with gators enhance the old school appeal of the bike. The bike is combined with the lower front and rear suspension together with a low, narrow, solo seat. The height of the seat is just 760 mm. The seat provides confidence and comfort to all size riders, experienced or inexperienced. The ride will be responsive and plush, no matter if you are dodging the urban potholes or you are on an exploration of the back roads. The seat of the bike is inspired by early days of the bubble, authentic and comfortable, ‘tuck and roll’ design. The peanut-shaped tank gets a clean design with the manufacturer's name in bold lettering. The Iron 883 is a raw, stripped-down, aggressive bike that gives the rider an authentic, throwback riding experience, and at a very aggressive price point. The bike weighs in at 260kg and is available in three colors vivid black, big blue pearl and black denim. The front-biased riding stance also complements the Iron 883’s sporty character and it is loved by the riders. It gets an LCD display in the instrument cluster which shows the gear position, revs, and other details. A switch facilitates scrolling through the menu on the display. Harley Davidson is well known to be very distinctive in terms of the method of delivering output and transferring it to the road in an easy and comfortable manner to the riders overall world. Harley Davidson Iron 883 miles on speed with surprising potency all thanks to the wonderfully linear torque curve. The 255 kg curb weight of the bike does not feel like much and the bike handles corners with surprising ease. The aggressive drag inspired flat and forward handlebars to work with the mid-mounted front foot pegs with integrated controls to give you a very aggressive seating position. 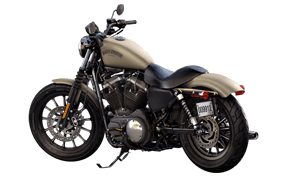 The Iron 883 features a 100/90 front on a 19-inch wheel and wide rear 150/80 on a 16-inch wheel, and hence this bike is successful in the handling gains immensely especially at low speeds. The Braking duties of the bike are taken care of via a 2-piston single disc front and 2-piston single disc rear brake system featuring braided steel lines for maximum braking efficiency. The torque engine is mated to a 5-speed transmission that helps keep the engine speeds and wheel speeds in constant balance ensuring that power and torque are available throughout the rev range as and when required depending on the road and riding conditions. Comprehensive insurance is the ones that cover against all types of wear and tears to the Harley Davidson across its dealers. Optional Coverage such as personal accident covers for the rider, Zero Dep cover and etc. One needs to pay the extra cost for the optional coverage. Liability-only policies that cover only against injuries arising from third-party action during the bike accident. Harley Davidson Iron 883 prices start at Rs. 8.11 lakh (Ex-Showroom). Harley Davidson Iron 883 is available in 1 variant and 4 colors.